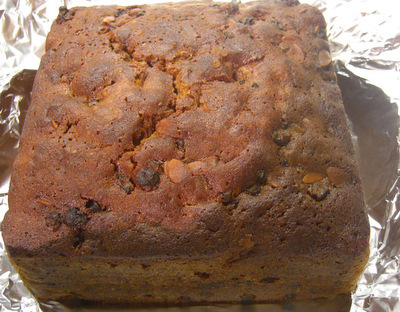 A really good Christmas cake is within your grasp. This is a really easy recipe that is quite forgiving if you don’t have exactly the right ingredients. If you have to substitute anything, just ensure it weighs the same. First of all you gather all the ingredients and let them seep in alcohol for a week. You make an easy cake mix and combine the two and cook – simple. Do make this as soon as you can, to allow it to mature. 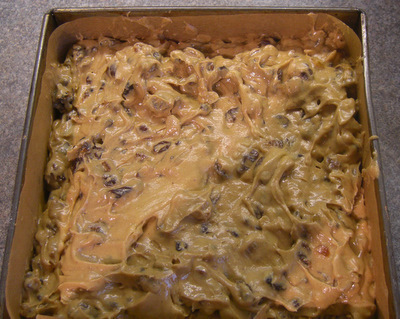 You’ll need a square cake tin about 20cm across and baking parchment or greaseproof paper. It's well worth soaking the fruit before making this cake. The result is so moist and flavoursome. Cover with marziipan and ice close to Christmas. 250 grams self-raising flour (or plain plus 2 tsp baking powder) This is equally good if made with Dove's farm gluten free self raising flour. In a saucepan, put all the ingredients and warm through until the sugar is dissolved. Take off the heat and let it cool. Scrape all of the ingredients into a box with a lid and put into the fridge. Try to remember to shake the box each day. A week later, you are ready to make the cake. You'll notice that the dried fruit has plumped up and smells wonderful! Before you start making the cake, grease your tin and line it with greaseproof paper or parchment. Turn the over on to Gas mark 3, 170 degrees. For ease, make the cake in a food processor or use a hand-held whisk. Whisk the butter and sugar together until well mixed, Add a little flour. Add the eggs little by little until all used up. Spoon in the flour and mixed nuts. Put this mixture into a large mixing bowl with the fruit that's been soaking and mix well. 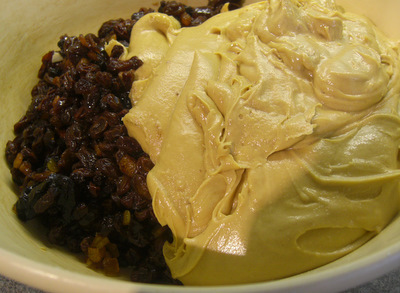 Carefully spoon the mixture into the tin, making sure that your lining stays stuck to the edges of the tin. Cook for approximately 2½ hours. PLEASE CHECK REGULARLY. The cooking time seems to vary greatly - particularly if you have a fan oven. Use a skewer to test if it is ready - it should come out clean. When it is done, leave it in the tin until cold. Turn out and store in silver foil until needed. I’m making my cake tomorrow, my recipe is similar. Do share your photos! I am sure it will be fabulous. Can you tell me if i can freeze this Christmas cake please. Hi Joan, I’ve not tried freezing it, but I cannot see why not. It does keep a very long time – months or more in a container. By the way there is no need to feed it with alcohol up to Christmas, it doesn’t need it.